This image from NASA’s New Horizons spacecraft shows Pluto’s Sputnik Planitia (formerly Sputnik Planum), which is about 650 by 500 miles (1,050 by 800 kilometres) in extent. 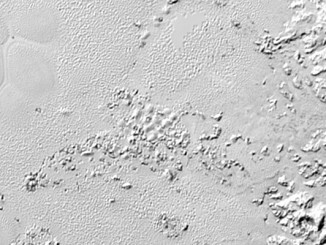 This famous heart-shaped feature is suspiciously well aligned with Pluto’s tidal axis. The likelihood that this is just a coincidence is only 5 percent, so the alignment suggests that extra mass in that location interacted with tidal forces between Pluto and its moon Charon to reorient Pluto, and the best explanation for the extra mass is a subsurface ocean. 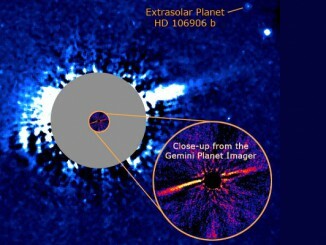 Image: NASA/JHUAPL/SwRI. Sputnik Planitia, which forms one side of the famous heart-shaped feature seen in the first New Horizons images, is suspiciously well aligned with Pluto’s tidal axis. The likelihood that this is just a coincidence is only 5 percent, so the alignment suggests that extra mass in that location interacted with tidal forces between Pluto and its moon Charon to reorient Pluto, putting Sputnik Planitia directly opposite the side facing Charon. But a deep basin seems unlikely to provide the extra mass needed to cause that kind of reorientation. “It’s a big, elliptical hole in the ground, so the extra weight must be hiding somewhere beneath the surface. And an ocean is a natural way to get that,” said Francis Nimmo, professor of Earth and planetary sciences at UC Santa Cruz and first author of a paper on the new findings published today in Nature. Another paper in the same issue, led by James Keane at the University of Arizona, also argues for reorientation and points to fractures on Pluto as evidence that this happened. The geologic structure beneath the surface of Sputnik Planitia, which is believed to be an ancient impact basin that has since filled in with volatile ices. 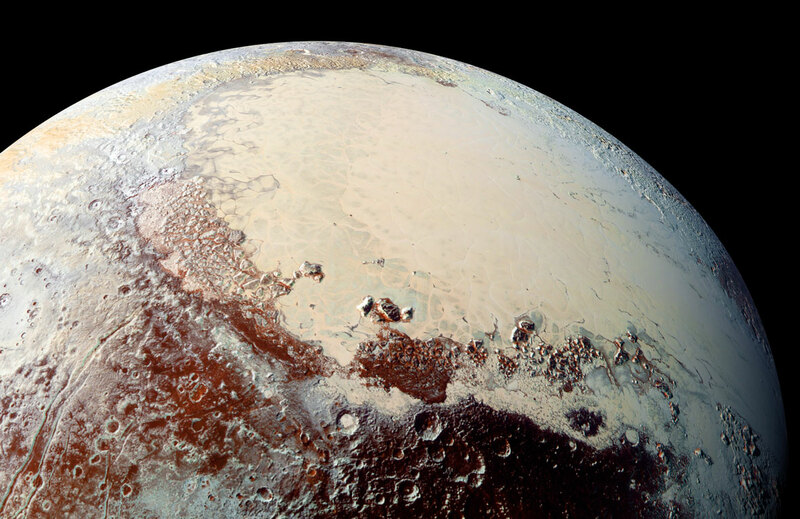 On Pluto, it is possible that the thinned crust is overlying a liquid water ocean. Click image for a larger-scale version. Illustration credit: James Keane. Like other large basins in the solar system, Sputnik Planitia was most likely created by the impact of a giant meteorite, which would have blasted away a huge amount of Pluto’s icy crust. With a subsurface ocean, the response to this would be an upwelling of water pushing up against the thinned and weakened crust of ice. At equilibrium, because water is denser than ice, that would still leave a fairly deep basin with a thin crust of ice over the upwelled mass of water. Nimmo and his colleagues also considered whether the extra mass could be provided by just a deep crater filled with nitrogen ice, with no upwelling of a subsurface ocean. But their calculations showed that this would require an implausibly deep layer of nitrogen, more than 25 miles (40 kilometres) thick. They found that a nitrogen layer about 4 miles (7 km) thick above a subsurface ocean provides enough mass to create a “positive gravity anomaly” consistent with the observations. “We tried to think of other ways to get a positive gravity anomaly, and none of them look as likely as a subsurface ocean,” Nimmo said. Coauthor Douglas Hamilton of the University of Maryland came up with the reorientation hypothesis, and Nimmo developed the subsurface ocean scenario. The scenario is analogous to what occurred on the Moon, where positive gravity anomalies have been accurately measured for several large impact basins. 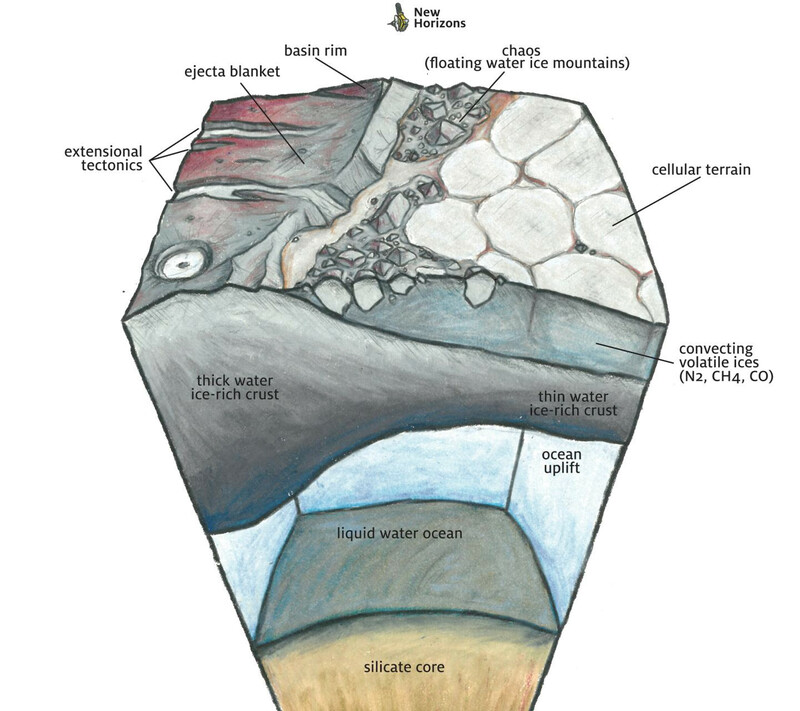 Instead of a subsurface ocean, however, the dense mantle material beneath the Moon’s crust pushed up against the thinned crust of the impact basins. Lava flows then flooded the basins, adding the extra mass. On icy Pluto, the basin filled with frozen nitrogen. “There’s plenty of nitrogen in Pluto’s atmosphere, and either it preferentially freezes out in this low basin, or it freezes out in the high areas surrounding the basin and flows down as glaciers,” Nimmo said. The images from New Horizons do show what appear to be nitrogen glaciers flowing out of mountainous terrain around Sputnik Planitia. There are other large objects in the Kuiper belt that are similar to Pluto in size and density, and Nimmo said they probably also have subsurface oceans. “When we look at these other objects, they may be equally interesting, not just frozen snowballs,” he said. 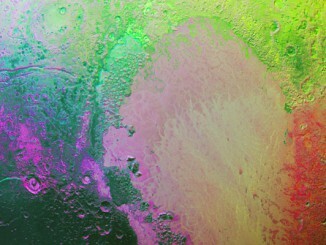 NASA’s New Horizons scientists made this false colour image of Pluto using a technique called principal component analysis to highlight the many subtle colour differences between Pluto’s distinct regions. The image data were collected by the spacecraft’s Ralph/MVIC colour camera on 14 July at 11:11 UTC, from a range of 22,000 miles (35,000 kilometres). The nitrogen ice glaciers on Pluto appear to carry an intriguing cargo: numerous, isolated hills that may be fragments of water ice from Pluto’s surrounding uplands. Since water ice is less dense than nitrogen-dominated ice, scientists believe these water ice hills are floating in a sea of frozen nitrogen and move over time like icebergs in Earth’s Arctic Ocean.